The easiest egg sandwich you'll ever make. Place two cast-iron skillets on burners, one over medium and the other over medium-low. Place three slices of pancetta in the pan over medium-low and cook until golden and crispy. Split English muffins by hand and spread 1/2 tablespoon of mayo on one interior side each English muffin. Place English muffins mayo-side down in the medium-heat pan and cook until golden and crispy. Remove pancetta from pan, crack, season, and fry the eggs sunnyside up in pancetta fat. To assemble, spread the remaining mayo on the crispy mayo side of the English muffin. Drizzle maple syrup on the side of the English muffin that doesn’t have mayo. Place egg on mayo side of muffin and top with a slice of cheddar cheese. 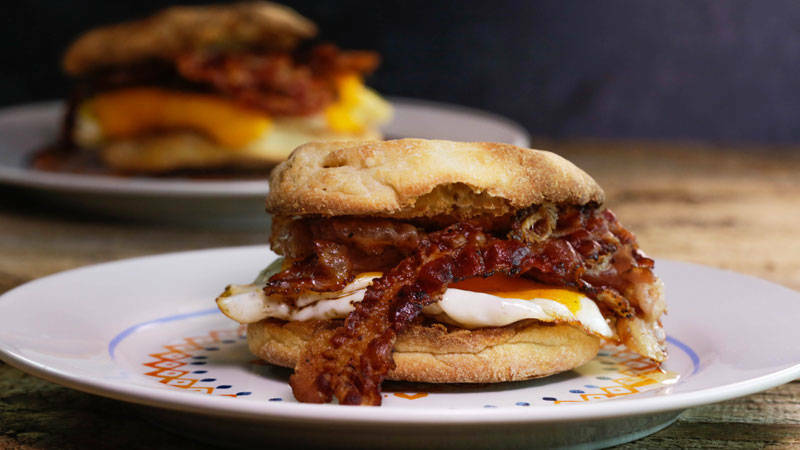 Place crisp pancetta on maple syrup side and combine both sides for a delicious breakfast sandwich.